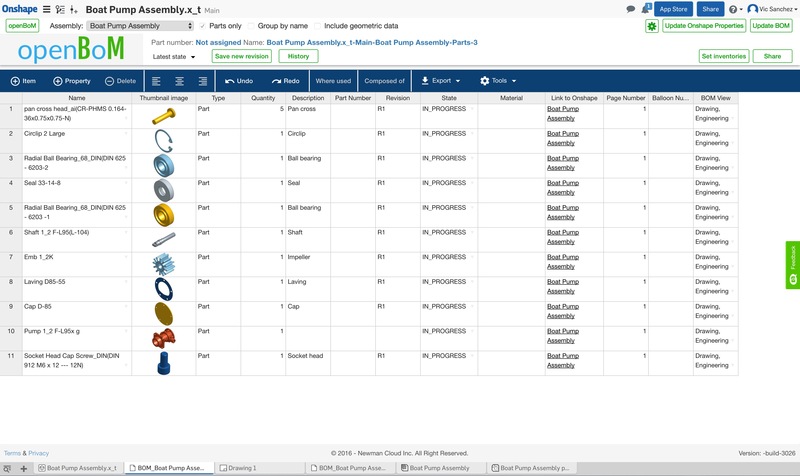 OpenBoM, the world’s first multi-tenant BOM management solution, is announcing a powerful new set of features for its integrated app with Onshape, the world’s only full-cloud CAD system that runs on any computer, phone or tablet. OpenBoM will be co-sponsoring the Onshape Agile Design Pavilion (Booth 3401) on February 7-9 at the Pacific Design and Manufacturing Expo in Anaheim, California. At the conference, openBoM will unveil BOM for Onshape Drawings, a new feature that significantly increases the fully cloud-based collaboration between Onshape and openBoM. With the new feature, changes to an Onshape design will automatically be reflected in the BOM, ensuring that the drawing remains accurate and up-to-date. Configured BOM drawing view, including pages, and balloons. Reference properties connecting Items in the BOM with Onshape design URLs, e.g. Documents, Parts, Assemblies. Improved navigation and application layout. Early visibility of openBoM multi-level BOM collaboration tools. “The Pacific Design and Manufacturing Expo offers openBoM and Onshape an exciting venue to highlight how cloud technology is improving manufacturing and helping customers to remain competitive by using powerful new design tools,” said Oleg Shilovitsky, CEO and Co-Founder of openBoM. openBoM was co-founded by Oleg Shilovitsky and Vic Sanchez, both experienced software industry veterans. It is a cloud data management tool that removes the traditional pain of managing BoMs across organizational and geographic boundaries. Headquartered in the Boston, MA area, openBoM’s website is at http://www.openbom.com. Learn more how openBoM is the new alternative to BoM spreadsheets. For more information or questions please contact vic(at)openbom(dot)com. openBoM is a wholly owned and branded product of Newman Cloud, Inc.
Onshape is the only company in the world 100% focused on cloud and mobile CAD, offering the first professional 3D CAD system that lets everyone on a design team work together using any web browser, phone, or tablet. As the leading CAD platform for Agile Product Design, Onshape helps companies design better products and bring them to market faster, offering real-time deployment, real-time data management and real-time analytics and controls. Using full-cloud CAD, engineers, designers and manufacturers get secure and simultaneous access to a single master version of their designs without the hassles of software licenses or copying files. Based in Cambridge, Massachusetts, Onshape includes key members of the original SolidWorks team plus elite engineers from the cloud, data security and mobile industries. For more information, visit Onshape.com/press-room.